So i know the games been "Dead" in numbers according to some people, and I have only started playing again the last month or so, but the game is starting to be more active again. I'm constantly in a full room with people lately and starting to enjoy it like I used to back in 06-07. Guilds are starting, theres 1 or 2 pvp rooms. I hope people who still browse the forums come back soon and play with the new community. Please make this game great again! The great thing about this game which I'm sure we can all agree on was the people playing it. So whos to say we cant enjoy it with new people that we're not used to. I would've posted screenshots but cant remember where they saved to. Just a pointless statement from a stupid random. Feel the power surging through your veins.. It is still pretty much dead since the last time I played which is ironically many years ago lmao. I'm quite surprised that it is still running and seeing familliar users active today. I guess they are still racking up money despite the low (somehow a few loyal) player base, well it's a private server so that's expected. The highest I seen active in-game daily was 100 to 200+ players and this was years ago. Well it can never go wrong as long as $$$ goes in. 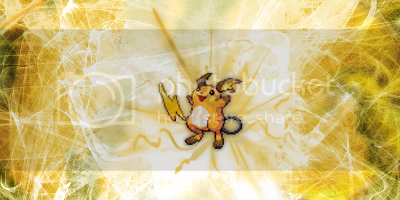 Thx to Pig for the Raichu sig.